If there's one tried and true way to raise the creepiness quotient of your online car ad, it's making a woman stand next to the car while you shoot the photos that will soon grace the pages of eBay Motors or Craigslist. But what if you can't convince a woman to come near you, let a lone lay spread-eagle on the hood of some old rust-bucket? Well, as it turns out, there are some folks out there who've become adept at creating answers for "What if I can't get a woman to..."-type questions out of silicone, PVC and steel. 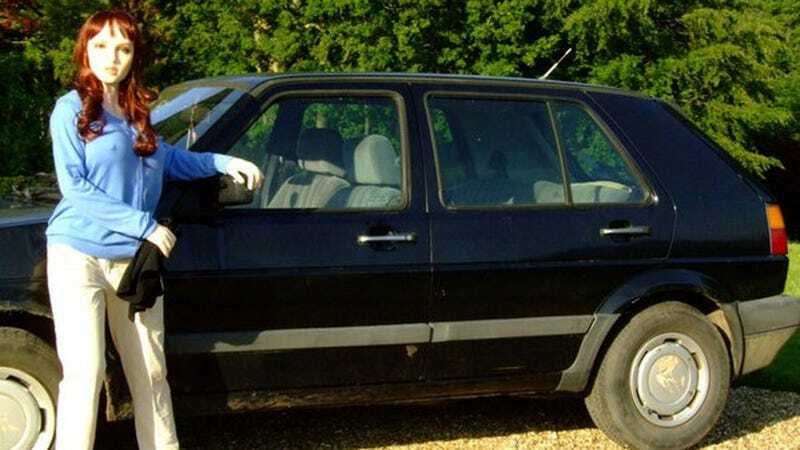 The seller of this VW Golf has decided to pose a conservatively-dressed silicone "friend" near his slightly rusty car, presumably because he thinks it will help attract a buyer. In one of the photos she points out a rust spot on the fender, earning points for her honesty. In another, she sits at the wheel. In all the photos, she purses her lips slightly and issues a wistful, far-off stare that we can't make heads or tails of. Anyway, thanks (?) to Twitter-user @abiwilks for bringing this to our attention.